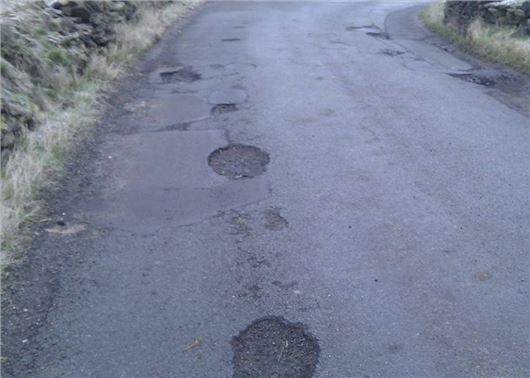 The Transport Committee has launched an inquiry into the state of local roads in England. Local roads make up 97 per cent of England’s road network length and carry two-thirds of traffic and almost all cyclists. Chair of the Transport Committee, Lilian Greenwood MP, has promised to address the “plague of potholes” and investigate funding constraints. “We know that this is a high priority issue among the public and I hope our inquiry will help put the onus on the Government to address it sooner rather than later," said Greenwood, who is the Labour MP for Nottingham South. "This plague of potholes represents a major headache for all of us. The consequences of a deteriorating local road network are significant – undermining local economic performance and resulting in direct costs to motorists, through damage to road vehicles,” she added. "This inquiry will be welcomed by drivers who have to endure the dire state of our local roads on a daily basis." Many local authorities are struggling to find the funding to repair roads. According to the latest Asphalt Industry Association survey, English councils have seen a marked decrease in the frequency of road re-surfacing, dropping from once every 55 years to once every 92 years. According to Cycling UK, potholes have been a contributory factor in 22 deaths and 368 serious injuries to cyclists since 2007. RAC chief engineer David Bizley said: “This inquiry will be welcomed by drivers who have to endure the dire state of our local roads on a daily basis. The reality is that potholes are dangerous to all road users, particularly cyclists. The Transport Committee is inviting drivers to send written submissions to the inquiry on local roads funding and governance. I disagree that "This inquiry will be welcomed by drivers who have to endure the dire state of our local roads on a daily basis.". I think most motorists will see the inquiry as a waste of time and money and would prefer local councils and the government to use a bit of common sense and get on with fixing them. One major step forward would be to ensure that repairs once undertaken are durable. I see far too many potholes that have been repaired breaking up again within weeks of completion. Councils never check the quality of work done by their own staff and that of contacted repairers which is leading to shoddy workmanship and a degree of profiteering. The problem is that it’s NOT their own staff that do it. It’s outsourced. I reported reflective keep left signs in February that are black with filth. They’re invisible at night and very dangerous. Two have been run into. I was assured by CHESHIRE East Coincil that they had been cleaned. They haven’t. Staff at councils look at a computer screen. No one goes out to see if the work has been done. And if you go to the council offices you can’t see anyone only phone them from the front desk! Also depends where you are. Just back from Leicestershire where every reflective sign was pristine so it is possible to achieve. So if they can’t clean a sign, they’re never going to fill potholes. Councils should be forced to ringfence money for resurfacing and repairing roads. They should also be compelled to properly resurface (no tarspray! ),say, 5% of the roads they are responsible for each year. That way we will perhaps get near to the standards of French roads. The councils can find the money to install road humps but not to repair potholes. One main difference between France and UK, especially on Motorways, is that when laying a dual carriage way, theyt use a tarmac layer the full width of the highway so there sre no joins along the length of the road. Here in the Uk, we use a single width machine,and get the usual breakdowns between the various widths on rwo and three lane roads. It ain;t rocket science, just common sense!! Take the repairs out of local authority control and get a resonsible oraganisation to do it properly. Puting a shovelfull of tarmac in a pothole and whacking it with the back of a shovel doesnt consitute a repair! This doesn't need an inquiry. It needs Government to give local councils sufficient money to re-surface all roads. It's a disgrace they don't understand the problem. BTW, even the M4 is starting to break up now - although I realise this isn't local authority responsibility. Its not that simple. As others have commented lots of repairs last only weeks/months, patching holes is undertaken when it would be sensible (and cost effective) to resurface the stretch of road, often quite short stretches on one side of the road (eg the repairs recently done to the B3009 in Oxfordshire), the failure to use modern equitment which produce solid very long lasting repairs and the misuse of money. In Oxfordshire 3 examples. First the new road layout near the railway station. Whilst improvements were needed these not only took ages (way over schedule) and losds of money but then had to be revisted twice to mske good the cracks etc which appeared in weeks. Second Slade Road (leading to Headington) which involved creation of a huge cycle lane over a long time at huge cost. End result road surface the same as before and the cycle lanes virtually unused. Third and in progress Headkey Way outside the John Radcliffe hospital involving much the same though this time with destruction of thres and shrubs at cost of millions. This doesn't need an inquiry. It needs Government to give local councils sufficient money to re-surface all roads. It's a disgrace they don't understand the problem. Use the money that this inquiry costs to fill in some of the potholes, my local council (Surrey Heath)don't seem to know what they are doing in the first palce, in my area they recently re-surfaced the road but did not fill in the potholes first, yes you gussed it, the re-surfacing material just sunk into the potholes leaving the same hole, you could not make it up. Biggest problem is poor workmanship. Nobody cares about the quality of the work or the length of time repair will last. The council just hands more money out to contractors who get rich from doing poor quality work with the cheapest materials. They can get away with it knowing the council will not check because they to don't care, it's not their money! Maybe the answer is to make someone resposible, not have another enquiry. This must not be allowed to become another political football. The Government is clearly responsible,sin ce they are in power, but this is clerly a matter for all MPs. A budget of sufficient amount to do the job properly within a set time should be set aside and approved by the whole House. The successful person to run this will be paid nothing but a true living wage. They will be rated and paid on performance only, a responsibility of the whole House..
That person will have to give a Press Conference every week before they answer questions in the House immediately after Prime Minister's questions on a Wednesday, when reporters are present and the House is full.. If this raises problems of procedure, the appropriate people shall sort them! At the latest, this procedure needs to be ready to GO by March 2019. Councils always find the money to fund increases in members' allowances.They also find money to fund 'community' projects that win votes at election time. Motorists are not organised into groups and have little clout. This government cuts rubbish is what socialists will away say . Prioritize your spending is what it is about just like at home.The community groups will have to earn some money . i do not recall teh Scouts ,when I was in them, receiving money from teh local council or any help at all. The Councils spend more money painting white lines around the holes than repairing them. Make the millions of adult cyclists, pay a modest tax per cycle. say £20 each per annum would raise lots. They use the roads often without care and dont pay a penny towards the cyclist specific modifications to the road networks. Why should the motorist be continually be penalised, all users should pay. It's not cyclists who wear the road surface out: it's heavy motor vehicles, especially juggernauts. Moreover cyclists do pay for road maintenance through their Council Tax. As for what passes as cycle lanes, you wouldn't see Laury Kenny training on them! As a motorist and cyclist too, I never feel endangered by a careless cyclist, but I do feel endangered by inconsiderate motorists. Councils are very good at moaning about lack of funds for essential public services, but also very good at spending on their new flashy offices and in-house services and equipment, for which there is never any shortage of funds. They fail to prioritise and blame anyone but themselves for their inept management and delivery of services. We certainly do not need an enquiry into potholes, but we do need a rethink on how local services should be funded and organised - and who should undertake them. This is just another example of poor management of public funds that are not targeted towards the services the public expect and deserve, with poor value for money and inadequate accountability. I agree that lit bollards need cleaning regularly. On the A6075 between New Ollerton and Kirton the signs are so filthy in winter that you can't even tell they are supposed to be lit bollards! This is criminally dangerous and no doubt has led to many accidents. It is very confusing to motorists who don't live in the district. And, as others have remarked. the local councils need more cash from central government!. Let's face it; this country is utterly rubbish at spending money on anything to do with maintaining infrastructure. It is a total amd utter disgrace to have let the roads get into the condition they have! Enquiries aren't needed - REPAIRS ARE, NOW!! Every day I like this country less amd less. We pay our road fund license and get shoddy repairs to B roads and it is taking b***** YEARS to make the M6 into a smart motorway! Not fot for purpose. Journeys up amd down the country take at least 20% longer due to total mismanagement across the board. Time for a change. There are many prongs to the establishment plan to price ordinary people off the road, this is just one of them. Congestion on British roads is so bad now it is affecting our economy, it must be as it takes so long to get from A to B these days. As motorists we have to pay eye watering amounts of money through taxes to keep a car on the road but road surfaces as bad as they are means many more expensive repairs to our vehicles. Even if a pothole doesn't directly ruin your suspension constantly travelling over these rough surfaces is enough to shake a car to bits over time. It is outrageous that Councils can afford to pay for so many staff working cushy hours in nice buildings while the colossal Council Tax they rake in, which is a massive burden to most people, apparently never provides enough money to fund all the things they are supposed to pay for. Council leaders should never be on such high salaries apart from anything else, some are on £250,000pa - £350,000pa which is more than the PM gets, quite ridiculous! Whenever Councils do get more money it is simply sucked into the system and makes no difference, it's all a bit like the NHS, another black hole of inefficiency and waste. Local government must be made to stop wasting money on crazy projects nobody wants and perform their duties in the best interests of the community, not themselves. There are no excuses for our road network to be in the appalling state it is, there is money in the system if only these useless civil servants would get their heads out of their a***s and do their jobs properly at last!